Play Wheel of Fortune: Deluxe Edition Now! Shopper's Bazaar was one of the first gameshows ever to get it's name dissed right off the face of the earth - and get it's next name - Wheel of Fortune. So a little history for you there. The original Wheel of Fortune was called Shopper's Bazaar, and it looked nothing like it does in this video game. Well, enough about history - here's the game. Now the whole idea behind Wheel of Fortune is winning cash and merchandise by solving puzzles and spinning a big wheel. Now in fair comparison to the 1992 version of Wheel of Fortune, this one is much worse. The only few additions is a sadder looking puzzle board, new avatars, Vanna looking much worse than in the last game, a new look of the wheel, and a few more things I can't remember. But you will get 2 extra rounds of play (a 4th round and a speed-up round, in which Vanna spins the wheel and whatever she lands on is the main cash value for the round). The same voice from Vanna and her lovely mug shot in the intro. Wanna see that mug shot? Hit "Play Now." 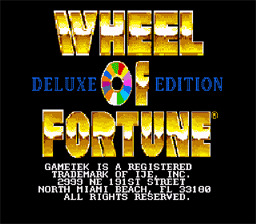 The object of Wheel of Fortune is to solve puzzles by spinning a wheel and guessing letters in the puzzle. The wheel holds several dollar values, including the dreaded Bankrupt and Lose-a-Turn. But it also has insane dollar amounts such as $1,000, $2,500, $3,500, and the more than fine $5,000, and that lovely green space called "Free Spin". The person who has the most money at the end of the game wins and goes on to the bonus round. It doesn't matter if they win that or not. How to make sweet bucks. Lets say you've run into a nice puzzle, and you know the answer. now take this approach - if you hit a low amount number, don't pick a letter that has lots of spaces in the puzzle, and don't pick a low profile letter on a high dollar amount.